Nissan was teasing its latest NISMO products for quite a while, trying to build as much buzz as it could surrounding its ‘new’ models. Then when the curtain was finally drawn back on the NISMO cars, we found very little to be excited about, including the Juke NISMO and this, the 370Z NISMO. Trying to further invigorate the NISMO brand, Nissan has provided French publishing house L’Ecurie and INTERSECTION Magazine with a 370Z NISMO for participation in this year’s Gumball 3000 Rally. So what sets the 370Z NISMO apart from the standard 370Z? The NISMO-tuned 370Z’s engine has been upgraded to 350 horsepower and the suspension and chassis have been tweaked for improved handling. For those of you who don’t know, the Gumball 3000 is a non-competitive (wink wink, nudge nudge) seven-day promenade beginning in Copenhagen and concluding in Monaco at the Formula 1 Grand Prix De Monaco 2013. We’re certain it will be nothing like the infamous Cannonball Run, despite there being a Lamborghini Countach, Aventador, the hotted-up Z car, Ferraris, Porsches and a built Mustang involved, among other entries. Right. 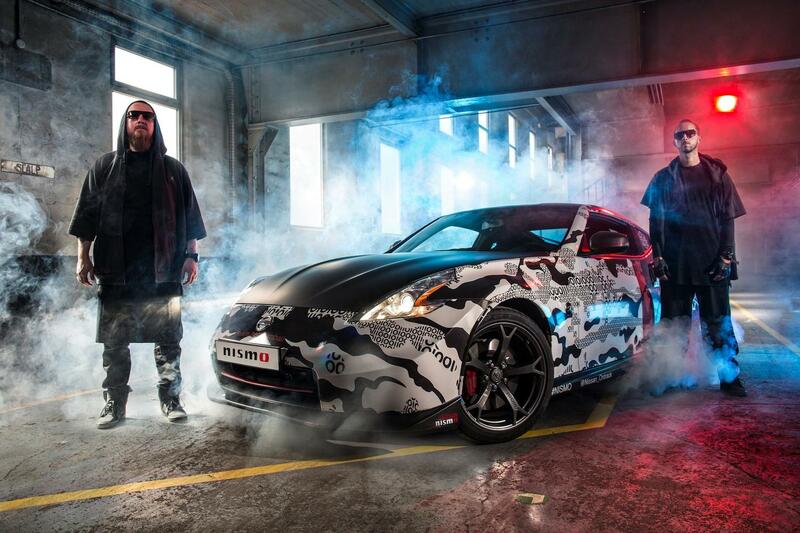 Nissan and L’Ecurie and INTERSECTION Magazine added a flat black hood and some digital white and grey camouflage to the exterior of their 370Z NISMO and plan to hand the keys over to Gumball 3000 regulars Patrice Meignan and Jeremy ‘Jey’ Taltaud, who – if we’re honest – look like a couple of Eurotrash chuckleheads. So they match the now uglified car perfectly. Millions of spectators congregate along the highways and byways along the Gumball path to witness the parade of sports and supercars as they, of course, chug along in 2nd gear at or just below the speed limit. Will you be among them? Send us some photos!